You have three hours to complete this multiple-choice, 100-question exam. Only one exam may be taken in a three-hour period. 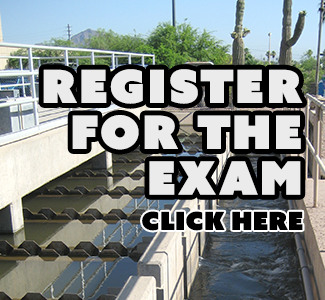 You must earn a grade of 70 percent or higher to successfully pass the exam. Exam scores will be available immediately for web based exams. Written exam scores take four to six weeks. The Individual Mastery Report will be sent via email to the address provided during registration. A Photo ID must be presented before the test. ADEQ allows the use of non-programmable calculators and formula/conversion sheets. Formula and conversion sheets will be supplied at the testing site. The following "How to Become Certified" document cover topics listed on the ABC Need-to-Know Criteria. Providing this list of references does not constitute an endorsement. The references on the list are not the only training materials available. Although you may use these resources in preparation for certification examinations, this list does not imply that any one of these references includes all information contained on an operator certification exam.